When I started playing tennis seriously, I had to overcome adversity at the clubs I went to. I was the only Asian girl and as a newer player to the club, I was not as skilled as the other girls. At these tennis clubs, you have to earn respect. The girls there would not want to play or even talk to you if you were not good enough. This wasn’t too hard for me to deal with, since back then I was a loner. I wasn’t very outgoing and had no self-confidence. But, like Michael Chang said: “You know, I feel like if I don’t change something, then the results maybe are going to continue the way they have. That for me is not something I want to really be a part of.” I didn’t want to spend the rest of my life standing in the corner. I wanted to stand out. So, I began to practice and enter in many tournaments. ADVERTISEMENT I also joined my high school team. I played in various tournaments and took lessons and I secured the last singles spot on my high school team. Over the years, I continued to play at the club and in tournaments, slowly gaining confidence in myself. I won almost all of the tournaments I played in. I started to put myself out there more, compete more and win more and when senior year came around, I was chosen captain! As captain, I didn’t want the new girls to experience what I had and worked to mentor them. Looking back at the past 5 years and on all that I've accomplished, I never would have thought it could have been possible. The person I am now is not the person that I was. Tennis has literally changed my life and I am forever grateful. 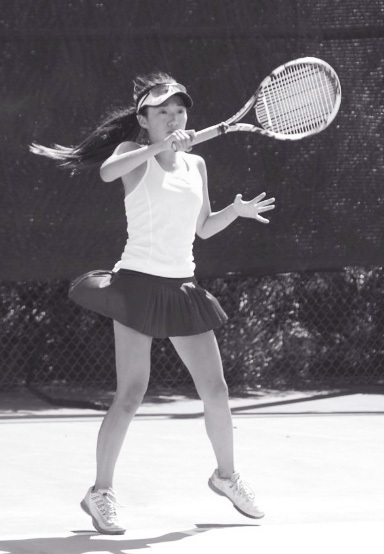 This game has helped me find myself and without tennis, I would still be that shy, quiet girl I was 5 years ago. I love tennis and will continue to play for the rest of my life, even when I am old and can only see the fuzzy outline of the green ball I have come to love. In college I will play on the team at University of the Pacific for the USTA Tennis on Campus program. At UOP, I will be in the 6 year Pharmacy program (3 of the years costing $85,000 a year).